Will a New Congress End War Profiteering without End? This past few weeks has been full of news about the US military, the most prominent tale, the resignation of General “Mad Dog” Mattis as Trump’s Defense Secretary. Much was made of his role as the last standing general (the Generals Flynn, McMaster, and Kelly already dumped by Trump by then). Often called an “intellectual,” Mad Dog’s regard for military tradition and restraint, for allies and diplomacy, butted heads with Trump’s even madder one-man genius. When Trump wanted a big and pricey military parade, Mattis advised against it, and so, we’re told, did he hold the line against other ill-advised moves. The general’s last straw was possibly a tweet about Syria, or maybe Trump’s order for US troops to rush to the Mexican border just before an election to defend us from an invasion of desperate refugees, mostly women and children. But a couple of related stories are worth bigger headlines and get less play, possibly because so much corporate money is at stake in DoD’s unthinkably huge contracts. The US Constitution calls for regular audits to ensure that money authorized by Congress is spent the intended way. Other agencies have met audit standards set by experts—except for the biggest discretionary expense in our national budget, the DoD. In its most recent issue, The Nation’s Dave Lindorff highlighted the DoD’s inability to complete its single long-called-for audit, and continued funding, despite a missing $21 trillion of taxpayer dollars from 1998-2015, a number five times larger than our government spends for everything each year. Regular laundering of money in changed accounts via what’s called “plugs,” apparently makes funds impossible to track, despite nonsensical numbers giving away the chicanery at work. One now retired supervisor of audits who worked for the DoD’s Inspector General’s office told Lindorff, “All those proposed budgets we’ve been presenting to you are a bunch of garbage.” It’s nice he can be frank, now that he’s got a pension. 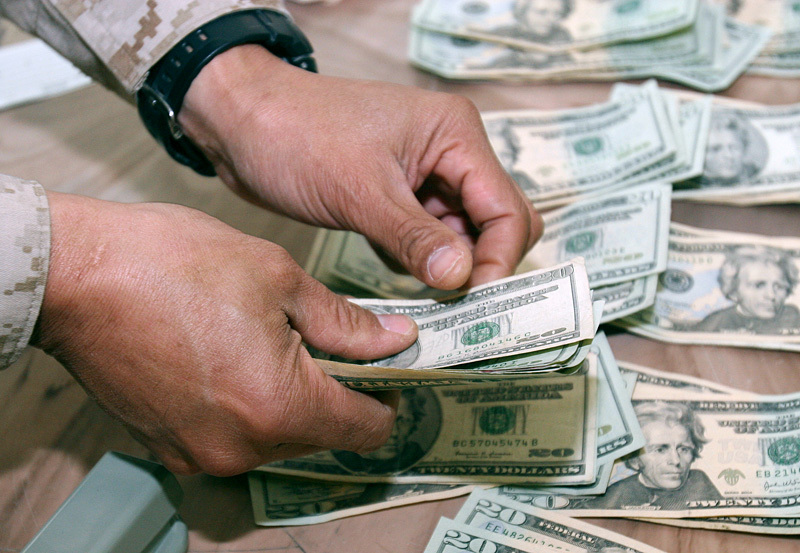 Increased budget requests based on fraudulent numbers belie a shrinking number of troops. The 15,000 soldiers in Afghanistan, for instance, are about 2.8 percent of deployment during Vietnam, and clues about grunt pay levels surround our military bases with pawn shops, repo car lots, and PayDay loan sharks. So where is our money going? And why does Congress continue to allocate growing budget numbers at DoD discretion, without demanding accountability? You need only see the new movie Vice to understand what he means about our current shooting wars, in Syria, Libya, Niger, Iraq, Yemen, Pakistan, and Afghanistan, none rightly authorized by Congress, but all apparently a cash cow.